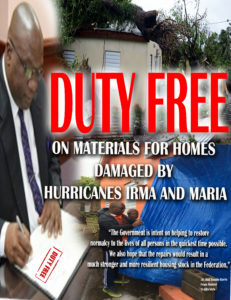 (Thursday October 5th , 2017):-The announcement of Duty Free Concession by Prime Minister Dr. Timothy Harris as part of Post Irma and Maria recovery efforts has been well received with Over 300 residents having applied to the government for the duty free concession on the purchase and importation of building materials to make repairs to hurricane damage on their homes. During his monthly press conference held on Tueesday October 3rd Prime Minister Harris speaking indicated that the Ministry of Finance had reported that some 300 plus persons applied for the concessions. The government has contracted the services of skilled professionals from the private sector to assist applicants with their damage assessments. All applications will and accompanying estimates will have to go through a transparent verification process before they can be approved. “The Ministry of Finance working with the Ministry of Sustainable development will recruit persons on a temporary basis to help with the estimates of the repairs to correct the damage should such assistance be required,” said PM Harris.